I began to delve into just that—listening, going to shows, scooting to Nashville now and then. 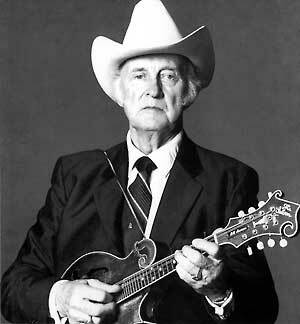 I bought a collection of Bill Monroe’s music. Over the coming years, I heard a lot of music live—Bruce Hornsby, Ricky Skaggs, Nickel Creek, J. D. Crowe, Earl Scruggs, Vince Gill, as well as a lot of lesser-known but excellent players and singers coming through the Station Inn in Nashville or here in Birmingham, especially at the old Moonlight Music Café and it’s descendant, Moonlight on the Mountain. I listened to all kinds of music, leading me back to the Carter family, rekindling my love for Johnny Cash, Merle Haggard, Willie Nelson, but also eventually delving back to my own eclectic roots in James Taylor, the Beatles (naturally), gospel music, hymnody, classical musick and the serendipity of albums I happened to buy at certain times. It’s a little like books—there is a playful randomness about what we find and read. Or rather, what finds us. Somebody tells us about a book they love, or something they came across while reading something else. Whatever interests you will eventually lead you forward and backwards, into new ideas, but also back into all that preceded it and explain it. As technology has made more and more available, it is possible for anyone with a computer to go and find all sorts of interesting musical ancestors. So for me, “exploring the discography” was going to graduate school. It led me first to my initial interest, bluegrass, but then on to jazz, blues, soul, R&B, folk, gospel, old-time, and all sorts of fusions. The intersections can be quite interesting. There are purists, of course, who insist on telling all the rest of us what we are supposed to like, and they are in every genre, but both the honoring of the past and the acceptance of the new have a place at the table of creation. In recent times, I find myself going back again. Perhaps an inevitable preference of aging, you want to re-touch meaning from the past. But I also think there is another rich vein of possibility unearthed when we cease from our worship of “novelty,” (which often turns out merely to be unconscious borrowing or worse) and revisit the discographies of the world. What we find is that, even if the work of art or song or words we read before are exactly the same, we no longer are. We hear differently each time. A little backward exploration enlightens you to know that everything is borrowed and reassembled. Monroe forged together old-time music with gospel, country, blues and other streams to create bluegrass. The Carter family recorded and handed down hundreds of songs that came from families and groups in the hills that had been sung for generations “by our people” and commercialized it as country music. The great classical composers always stood on the shoulders of others. The old becomes new when it is rediscovered and reqppropriated. “The Road Less Traveled” is one way to live. But there is value in traveling the road we have walked a hundred times with new eyes and ears. It can be an astounding discovery of something we never saw in the first place. So what is back there for you? It may not be music, but something that keeps yielding fruit for you may still be waiting where you left it. Posted on June 9, 2014, in Art, Banjo, Bluegrass, Blues, Country Music, Creativity, Dillard and Clark, Earl Scruggs, Folk, Gospel music, Hymns, Jazz, Music, Songwriting, The Dillards, The Dillards and tagged Bluegrass, Bruce Hornsby, country, creativity, discography, Earl Scruggs, folk, J. D. Crowe, James Taylor, Johnny Cash, Merle Haggard, Music, Nickel Creek, Ricky Skaggs, Station Inn, the Beatles, Vince Gill, Willie Nelson. Bookmark the permalink. 2 Comments. This is very good. We share an eclectic appreciation for a variety of music. I had not thought about the point you made concerning when we return to a book or a piece of music [or poetry], that it is never quite the same because we have changed. I thought about that and remembered those times. Sometimes the piece became more special, or special in a slightly different way. Other times, I wondered what I saw in it the first time around! Anyway, thanks for continuing with your blog. One question. I sent out an email to the Trinity Group about our website. I had tried to access it in order to load a sermon on Communion, but couldn’t open it. I asked if we had lost the website or what? Only faithful Fisher responded saying basically that he didn’t have a clue (that’s a paraphrase). Do you have any ideas about it. I wondered if there was an annual fee and that we just let it lapse. Basden and I were the only ones to use it regularly. I would have used it more had more of the group joined in, but I didn’t want the name Trinity Group to be associated with just my stuff. Anyway, is it gone? Well written and following a vein of thought I’ve been considering. I read an article in the New York Times regarding whether or not we really have free will or are we just a product of our experiences. Even when we do something unusual or “outside the box”, this also might just be a response to something we remember.